Chanukah (alternately spelled Hanukkah), meaning “dedication” in Hebrew, commemorates the victory of the Maccabees over the armies of Syria in 165 B.C.E. and the subsequent liberation and “re-dedication” of the Temple in Jerusalem. 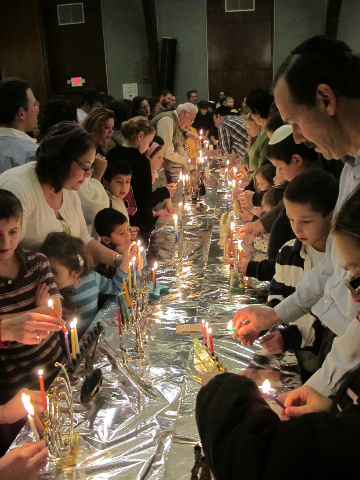 The modern home celebration of this eight-day festival centers around the lighting of the chanukiyah, a special candelabra for Chanukah; foods prepared in oil including latkes (potato pancakes) and sufganiyot (jelly donuts); and special songs and games.